Green greetings and a nourishing New Year to you all. I have settled back into my cozy Catskill home, just in time. Our flight out of Costa Rica was one of the last to get out, with the frigid storm vortex just starting to blow in as we landed in New York. As you have heard, temperatures hit all-time lows. Plants can deal with that. But what is really hard on them is for it to get super cold and then thaw suddenly and then freeze again. Yesterday it was 7 degrees Farenheit (-12C) and I was playing with my granddaughter on my frozen pond. Today there is thunder and lightning and torrents of rain, with temperatures in the 40's. And it will be cold again in a day. It's hard to adjust quickly if you are a plant! 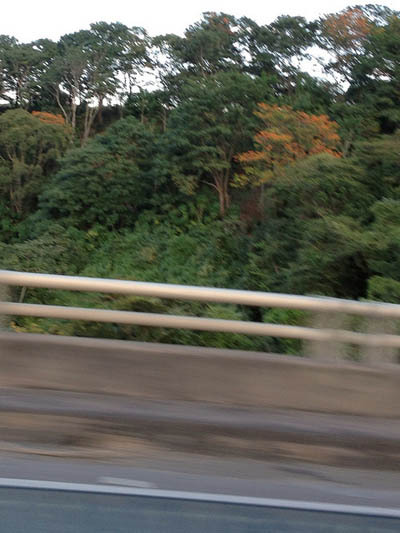 The weather in Costa Rica was breezy at night and sunny and warm all day. Not difficult for the plants to adjust to at all. At dawn the howler monkeys get going and so do most of the people, since work in the heat of the day is almost impossible. Our beat-the-heat trick is to get into the deep jungle where the sun can't get to us, and we found some wild, and some watery, jungle settings that we are excited to share you virtually and with the first participants in our Health and Well Being Adventures in reality next January. Of the many questions we have received about the Adventure, one really stands out for me. "How will what we learn about plants in Costa Rica be useful to me when I am at home?" My answer has several parts. 1. We will be learning about plant families as we learn about plants, so what we learn is applicable all over the world. 2. We will not be focusing on learning a lot of herbal medicine in Costa Rica. 3. Many tropical plants that grow in Costa Rica are sold in your local supermarket, including avocado, banana, papaya, vanilla, cinnamon, ginger, and turmeric, to mention but a few. And imagine my surprise to find medicinal uses for plants I have only known as house plants, such as wander Jew and sansevieria, that grow wild in Costa Rica! I promised you a bouquet, and I did stop to pick one for you. Actually, I picked at least two. Here's the first, with lots of sparking green blessings for you. Weeds, glorious weeds. Some are the same everywhere, and some are delightfully different. 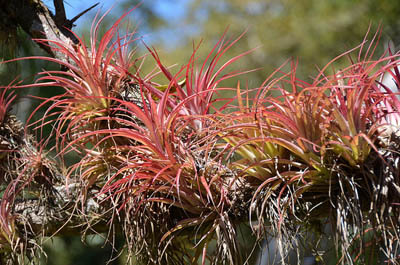 When I can find it, I give you the Costa Rican name of the plant first. Everywhere you go in the tropics, you see hibiscus. This is one of the places where it pays to learn the plants by their families. Hibiscus is in the Malva family, and all plants in this family are all edible and medicinal and quite interchangeable in their uses. So if you know about marshmallow, you already know how to use hibiscus too. 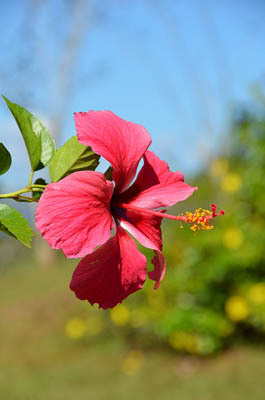 Hibiscus flowers are wonderful as a snack or added to salads. They can be dried for tea. The leaves and roots contain soothing substances. 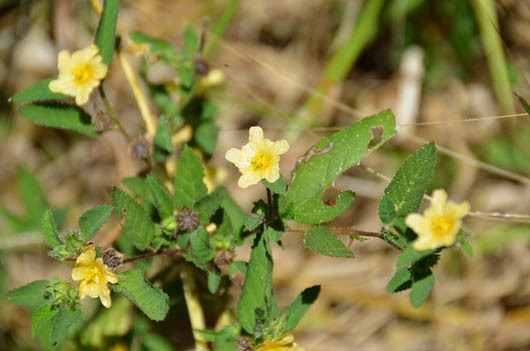 While hibiscus is generally cultivated, and requires so little in care that it may as well be a weed, this little yellow flowered plant is the weedy version of hibiscus. Known as broom weed, or escobilla, in Costa Rica , it is "one of the most common herbs in the neotropics." I have seen it in Puerto Rica, Jamaica, Florida, and of course, Costa Rica, happily growing on roadsides and in waste places. Like all Malvas, it is an expectorant and demulcent. 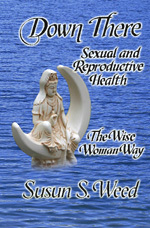 It is also uses to cool fevers and relieve the pain of herpes. 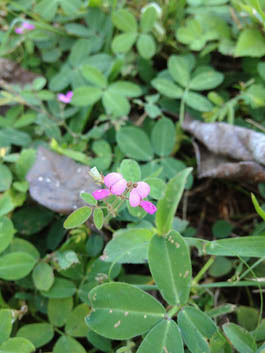 The legume family, the Fabaceae, has classic pea flowers and leaves in 3s (or any greater odd number), making it easy to recognize. All members of the family work in concert with bacteria to fix nitrogen in the soil. This is especially important in rain forests, where nitrogen is constantly washed away. When vanilla vines are grown on trees in this family, they can be grown organically, without fertilizers. Here are two tiny versions, one in purple-pink, and one in classic yellow. 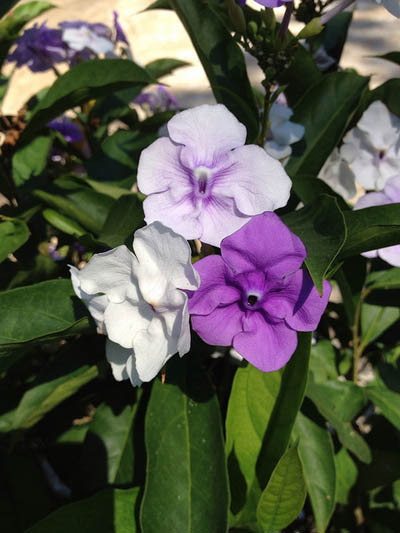 Compare these to the bean family plants in the bouquet I sent you from Miami. Their bean family sisters include not only peas and beans but red clover, alfalfa, and astragalus. 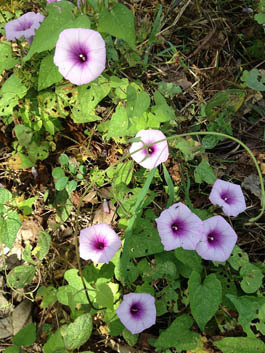 This wild member of the morning glory family profusely covers the roadsides on the way to the ferry to the Nicoya Peninsula. It fades away as we get further from people and closer to the jungle. It likes to play at being wild, but it really prefers to hang out where people disturb the soil. The strong little vines have been used as a natural string. The flowers are unsafe to use; the entire plant is considered a dangerous poison. 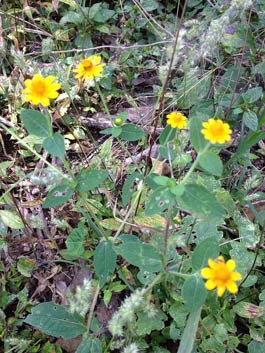 This is a classic DYC (darn yellow compositae). The Aster, or sunflower, family is one of the largest in the world, and many of its members have small yellow flowers with rays. Since all plants in the Aster family are generally considered safe to eat and use as medicine, we could experiment with this one, even if we don't know its name. 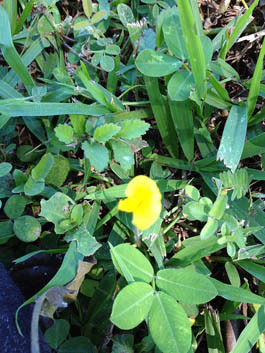 The yellow flowers suggest a liver energy. If it tastes bitter, the next step would be to make a vinegar or tincture of the flowering top and try it out. When I experiment with a plant, I usually begin with the flowering top, as it is less likely to be poisonous than the root. Pretty poison, I call her. Enjoy the beautiful flowers and the beautiful butterflies and hummingbirds that love these flowers, and leave it at that. 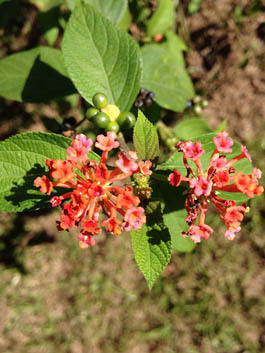 Do not even pick lantana as a cut flower. There are several toxic compounds found throughout this plant, which not only cause nausea, vomiting, and great weakness if ingested, they are also skin irritants. 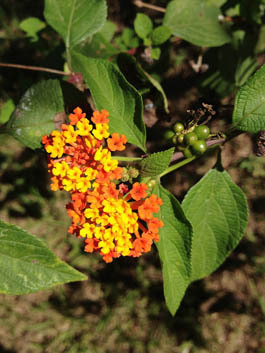 In a rather homeopathic use, though not in a homeopathic dilution, a wash of lantana – also called cinco negritos or bandera espanola – was used traditionally in Costa Rica to counter skin eruptions. I wouldn't try it. There are so many interesting, amazing, fragrant, useful, unusual, and stunning plants that I actually picked you two bouquets. 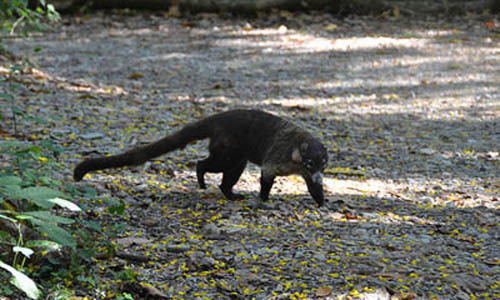 This raccoon-like scavenger hangs around the parking lot at Cabo Blanco. While getting out of the car, I set down my bag containing my shoes (just in case) and some Hypericum oil. Don't know which smelled better, but the coatimundi grabbed the bag and attempted to make off with it! Later, by the water, we saw a wild one, which, while not given to grabbing our bags, was, nonetheless, entirely unconcerned with our presence in its jungle. 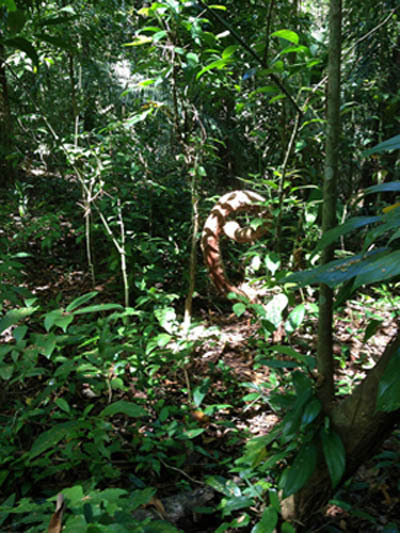 The jungle at Cabo Blanco Reserve. Here in the jungle are more than 475 species of plants, more than 950 species of insects, hundreds of species of birds (there always seem to be bird researchers in the park), mammals, and marine species. Vines loop and twist, and monkeys really do swing on them and play in the tree tops. Crystal clear waters at Cabo Blanco Reserve. The Reserve Absolut includes fresh water streams of amazing clarity. If you sit quietly, tiny little shrimp-like critters find their way to you and give you a pedicure by nibbling daintily on your cuticles and skin. The temperature of the water is slightly cool, the air is warm, wild animals go about their ways with no regard for the people, or if they do regard us, and the monkeys do seem to, it is to throw sticks at us. The path at Cabo Blanco Reserve. Volcanic activity – which is still ongoing in Costa Rica – has shaped the landscape, both in the jungle and on the beaches, with the unique forms of lava. 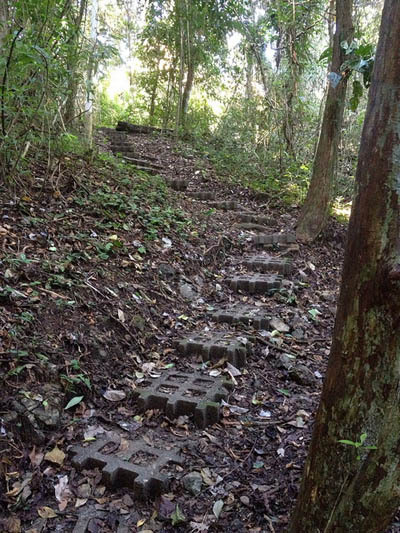 And lava is not flat, so all paths in Costa Rica go either up or down, often steeply, like this one. 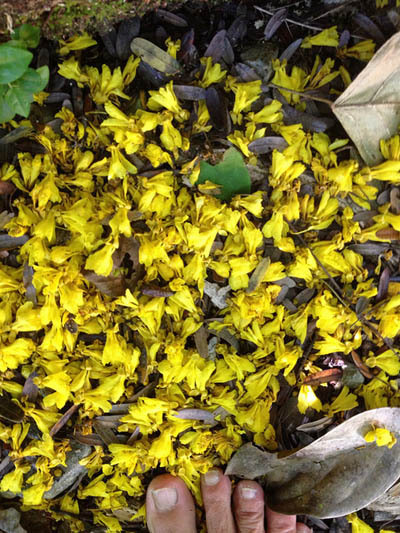 Fallen yellow flowers from a tall tree at Cabo Blanco Reserve. 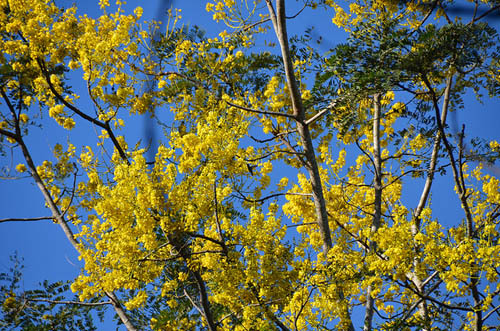 The tree with the yellow flowers. These fairly common trees are wildlife magnets. Wherever we saw them, we could be sure to see monkeys or hummingbirds or something enjoying the flowers. This stunning tree is so covered with orange blossoms that it seems to be a cloud. It is not so common as the yellow-flowered tree, and I did not have a chance to make its acquaintance, except from a car speeding by, but I suspect it is also beloved by all. I loved the individuality of the blossoms on this cultivated shrub at Casa Smythe. 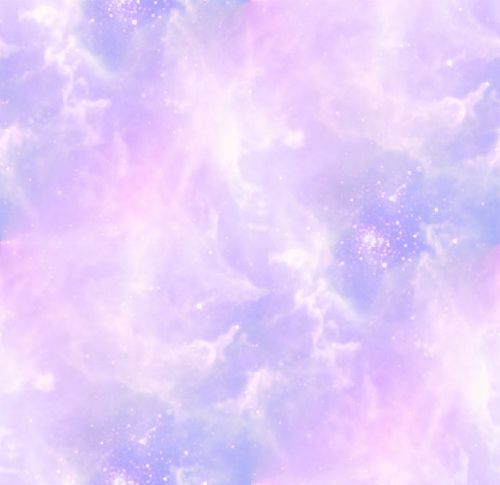 Some are purple, some are white, some are sorta in between (and they don't seem to change color), and all happy together. And the shape of the flower is intriguing as well, is it not? Easy to imagine fairy house there. 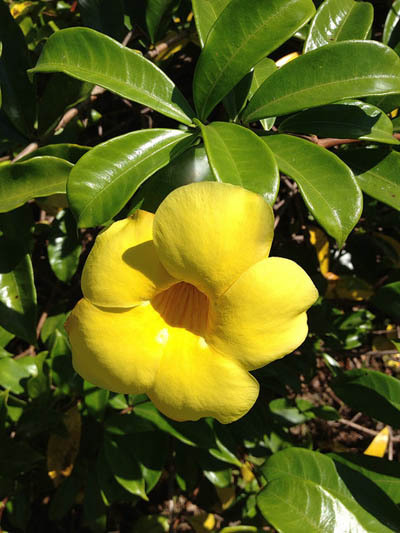 The last flower in my boquet for you to brighten up your winter day, is also on a cultivated shrub at Casa Smythe. It is as big as it looks. Each leaf is about the length of my hand, and the flower dwarfs them. Since the leaves are glossy, and slick is slick in the plant world as well as the human one, I am going to find out definitely what this is before I start tossing the blossoms into salads, but don't they look delicious? !